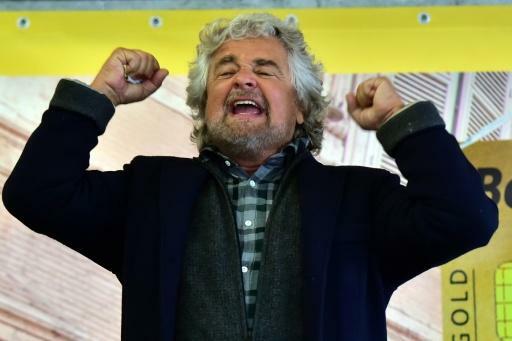 Italy’s acerbic Beppe Grillo may have hung up his political gloves to return to the comedy circuit, but backlash over a bomb joke targeting London’s new mayor has aggravated an identity crisis within his populist Five Star movement. Wild-eyed, outspoken Grillo took a swipe at Sadiq Khan in a Saturday night stand-up show, saying London’s first Muslim mayor — whom he erroneously called “Bangladeshi” — would “blow himself up in front of Westminster”. The bushy-haired 67-year-old comic, famed for his outbursts against the political system and co-founding Five Star, drew cross-party condemnation in Italy, with critics accusing him of fuelling xenophobic stereotypes and boosting the extreme right-wing. Grillo’s heir apparent Luigi Di Maio, 29, said the joke had been made on stage and should not be given a political twist while another Five Star (M5S) member Manilo Di Stefano told journalists the comic was actually mocking Italian racists. “Beppe has always brought the news into his stand-ups. And seeing as in Italy there’s rhetoric about Muslims blowing themselves up, he cracked the joke,” he said, adding that the movement’s guru was relishing now being “free to say whatever comes into his head”. But political rivals and commentators asked whether the populist movement can effectively claim to be Grillo-free. The Five Star has been rocked in recent weeks by scandals in two cities under its governance and Di Maio was forced to admit Monday that the movement’s founder was the only one with power to suspend or expel party members. “One day Grillo is the guarantor of the Five Stars, the next he is simply a comic who makes racist jokes. The M5S is in chaos and this is the proof,” Claudio Martini, a senator with the centre-left Democratic Party (PD) said. Fellow PD senator Pina Maturani quipped “congratulations on the confusion and ‘democracy’ and goodbye at the polls”. Franco Pavoncello, a political science professor at the John Cabot University in Rome, told AFP the Five Star was clearly under strain and “the tension between the movement’s identity when it began and after Grillo is destined to grow”. “M5S was born of Grillo’s desire to protest against a certain way of doing politics. But those elected by the movement’s online community are young and relatively inexperienced politically,” he added. Some commentators warned the bomb joke risked harming the movement’s campaign to win Rome’s mayoral election next month, coming as it does on top of investigations into the mayor of Parma for abuse of office and the mayor of Livorno for fraud. The Five Star mayors of those two cities insist they are innocent but the probes have embarrassed a self-described anti-corruption movement, and the M5S is counting on winning in Rome to give it the boost it needs to challenge Matteo Renzi’s centre-left government. Piergiorgio Corbetta, an M5S expert, said he did not think the joke in itself would have much of an impact on the mayoral race, but the movement was struggling to restructure itself after Grillo’s exit and the death of founding partner Gianroberto Casaleggio. “They are having a problem redefining their leadership. The movement is beleaguered by confusion and contradictions,” he said. “Luckily for them, the centre-right is having big problems and M5S is filling the political vacuum, but I don’t know how long that can last,” he said.